What is Zoho Projects ? Helps in planning projects, assigning tasks, keeping track on the work progress, managing documents, communicating seamlessly with the team to get the work done on time. 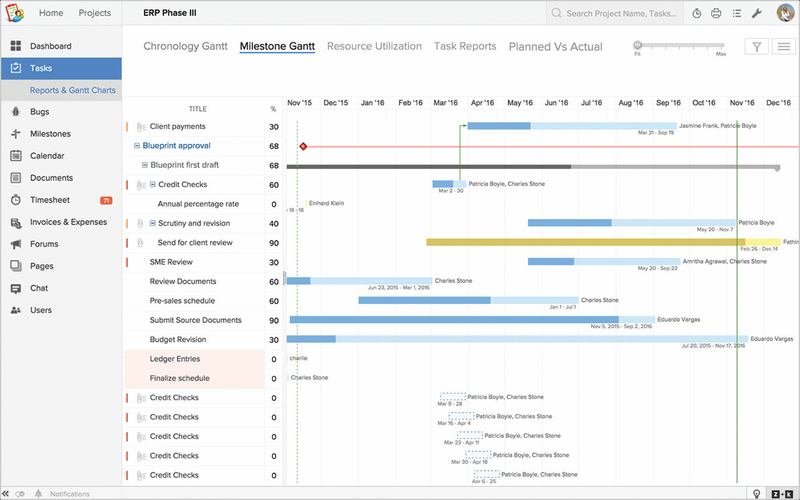 Navigates the workflow through mapping out Gantt Charts and time management sheets. Also useful for project budgeting and allocating it as per the resources available. Additionally, it tracks issues associated with the project and manages resolving them. Maintains a database in which, the whereabouts of the employees can be seen along with their skills and availability. 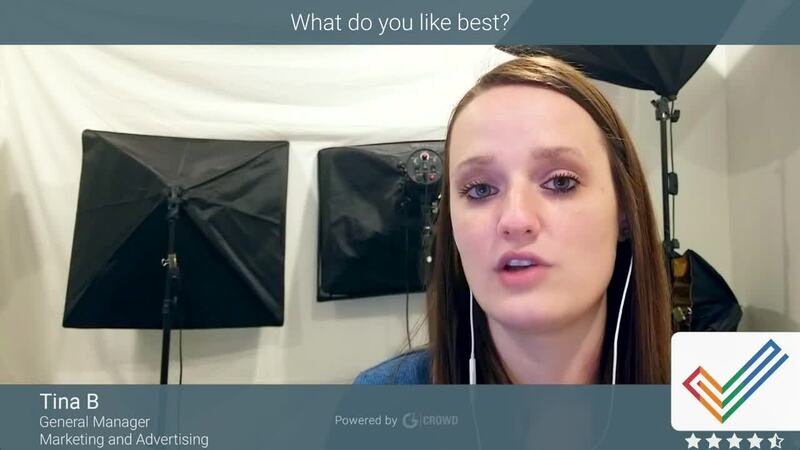 You can add unlimited members to your project without spending any extra money. Moreover, a mobile application also available to manage your task on-the-go. How much does Zoho Projects cost ? 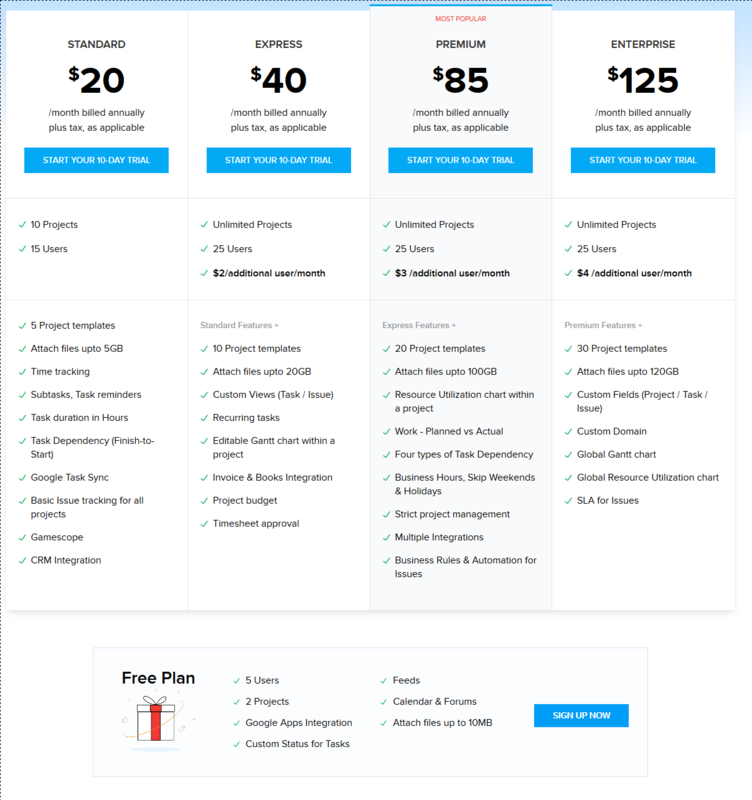 The pricing for Zoho Projects starts at $20.0 per month. Zoho Projects has 4 different plans such as - Standard at $20.0 per month, Express at $40.0 per month, Premium at $85.0 per month and Enterprise at $125.0 per month. Zoho Projects also offers a Free Plan with limited features. Pros: The single login with the ZOHO suite was a nice feature. I tried ZOHO primarily because I wanted one suite for the majority of my business app needs. 1. Integrations between ZOHO's own products are not as good as could be. And I have seen better integration with other PM software and third-party apps. 2. ZOHO suite, in general, does a lot of things, but most things not well. I signed up for ZOHO Projects primarily because I wanted to integrate it with other apps in the ZOHO suite. However, I found these integrations were not seamless and nowhere near as functional as they could be. For example; I use both Projects and Invoices for clients, can send them invites from both applications for a client portal. However, both portals require a seperate login for the client. This frustrates clients, as they know both apps are ZOHO, yet they need separate credentials. On my end, all of ZOHO's billing was not integrated. Which means there was a separate invoice and viewing page for billing for each ZOHO APP. I would expect billing to function more like G Suite, with all ZOHO apps billed together. As a stand-alone PM APP I found it not to be user friendly. You can't choose which fields or features you want. 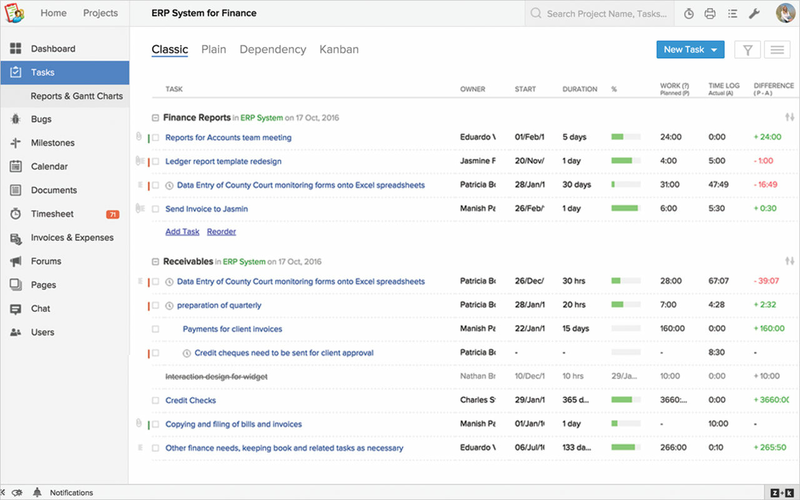 We tend to use more of a Kanban methodology and would prefer if task start and end dates were not mandatory. While I like the idea of the Sprint version of this APP, I wanted some of the client management features of full Projects. Overall: I wanted to love ZOHO Projects and all of ZOHO suits. And I still believe the concept is a fantastic one. 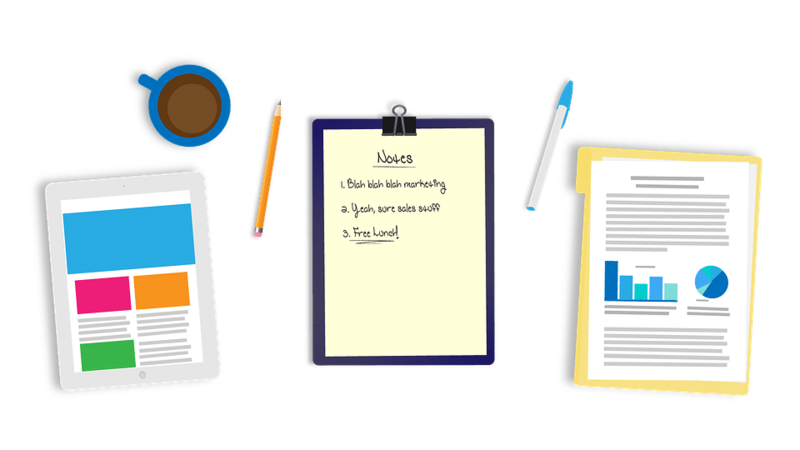 Most of the major apps any small business will need one place. But it felt like ZOHO haphazardly patched together apps from several different creators. I will be happy to try ZOHO again, once integration becomes more seamless. I look forward to newer versions! Choice to make custom stage names is exceptionally valuable as we can undoubtedly relocate our current undertaking to zoho ventures absent much work. One of the other critical highlights that Zoho offers is a choice to outline and forerunners of a specific errand. Assignments and issues are overseen independently and in this manner simple to oversee. Can make an errand rundown and achievements. Not a lot to hate only that the UI can be very confounding now and then to explore between various screens. In case you're searching for an ease, high component, cascade venture the board framework, you truly can't beat Zoho Projects. The standard in which this interface puts everybody, and along these lines the entire group can cooperate as one in synchronization with due dates, and comprehend the aptitudes of every single one, considering the devices of the control board, task the executives and blunders and authorizations. The administration additionally bolsters the future arranging of up and coming undertakings. I would prescribe. We're explaining issues with correspondence between groups, follow-up things and planning, and furthermore improving our conveyance time to customers on finished activities and proposition. We've drastically eliminated the volume of messages that we're sending to one another, and the majority of our records and informing is midway situated in one spot. We've profited by utilizing Zoho Projects since we have more prominent perceivability into the soundness of our tasks. 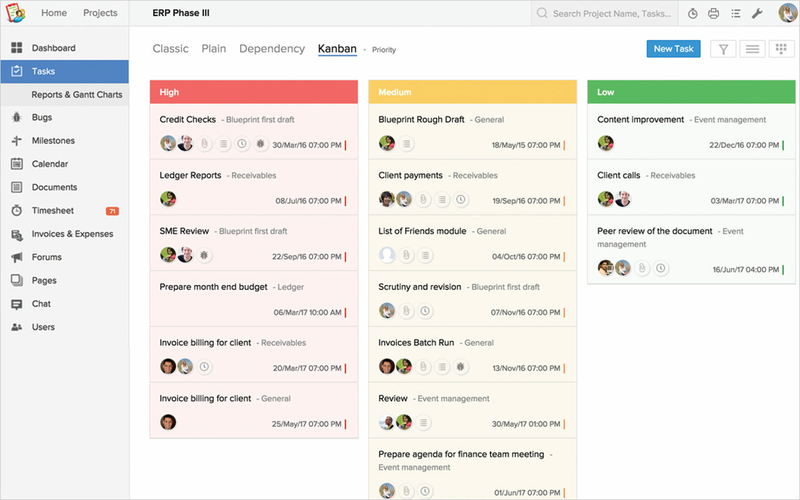 "Very good software for project management"
Its project view Class, Plain and Kanban are very good. All important stuff are quickly accessible everywhere in application. creation of Task, Dependency, Subtask, and scheduling are very good. Project Reports are also useful. There is no downside in using Zoho projects for mid and small organisations. However i would like to highlight few points. I could not found baseline feature in its standard edition which ideally should be included in standard plan. Zoho projects solved our day to day task management and milestone achievement. Now our team easily update their task progress on this platform. It creates transparency between other team members for dependency task which was difficult previously in absence of zoho projects. 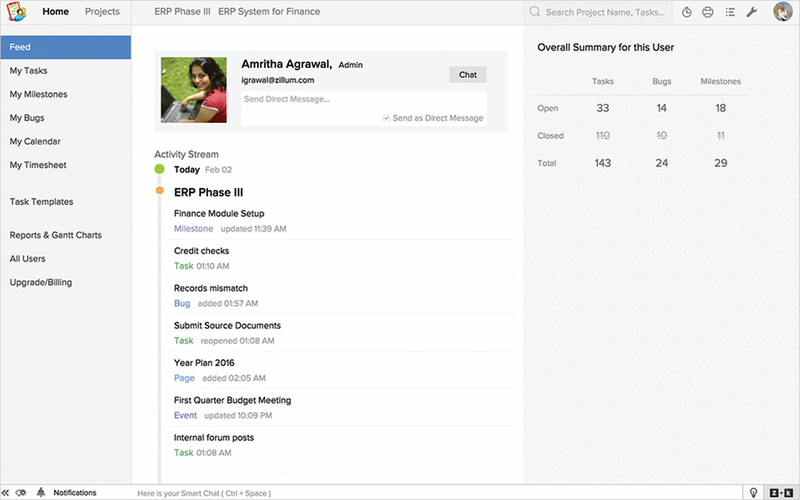 It is easy to assign and manage tasks using Zoho Projects. I not only like Zoho Projects's ease of use but I also like how organized the tool easy. Since we began using Zoho Projects in our firm, collaboration has improved. Therefore, it has changed our company to the better. Zoho Projects has cons. Initially you may encounter challenges when installing and learning its basics, but with time, you will enjoy its services because it is straightforward. I would advice team leaders and organization owners to adopt Zoho Projects because it will help them manage projects and distribute essential tasks to team members. I advocate for Zoho Projects because it is affordable and highly efficient to use. You will like its fantastic features. Our projects or tasks are all well-organized and efficient and all credit goes to Zoho Projects. We distribute tasks professionally to our team and manage them with ease. Therefore, Zoho Projects is a suitable collaboration software for us. As a small company we have found this software to be very useful and easy to set up. The initial days where we maintained excel spreadsheet software for all our projects have now been replaced with Zoho and it have helped our teams integrate and collaborate more seamlessly! Reporting is good and management can take decisions more real time! I have been using this software and initially found it time consuming to set up but once done it had been very helpful! Overall: During my evaluation of Project Management tools for my company I came across Zoho Projects. I tried it also for my personal usage. However, I still think that there are more mature products out there. Zoho projects is a very good project management tool and have almost all the features that are required for effective project management. 1. Option to create custom stage names is very useful as we can easily migrate our existing project to zoho projects without much work. 2. One of the other important features that Zoho offers is an option to map successors and predecessors of a particular task. 3. Tasks and issues are managed separately and thus easy to manage. 4. Can create a task list and milestones. 5. We can also update the dashboard according to our need and keep only the relevant reports on the dashboard. 1. Cannot be hosted on in house servers which were our first preference. 2. The UI can be quite confusing sometimes to navigate between different screens. Zoho is a very powerful project management tool and is not that expensive as compared to other tools in the same space. Zoho Projects has an easy to use interface designed to help you create, monitor, and complete projects. 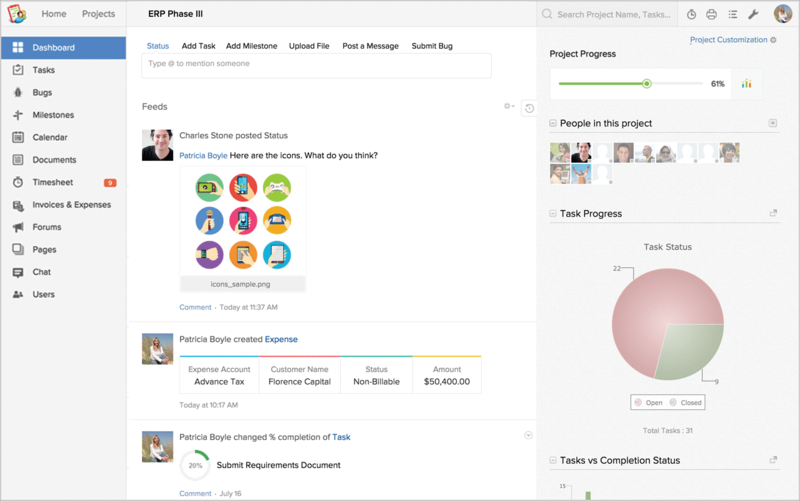 There are easy to build tasks and manage how they appear. Projects are outlined with graphs, so the information is easy to pull up and look at it. It was easy to implement for our project team. There may be a learning curve if you aren't familiar with how to set up. There are templates to help you if you get confused and tutorials are also found online. It may be a bit more than you want if you aren't using this software for long term usage. 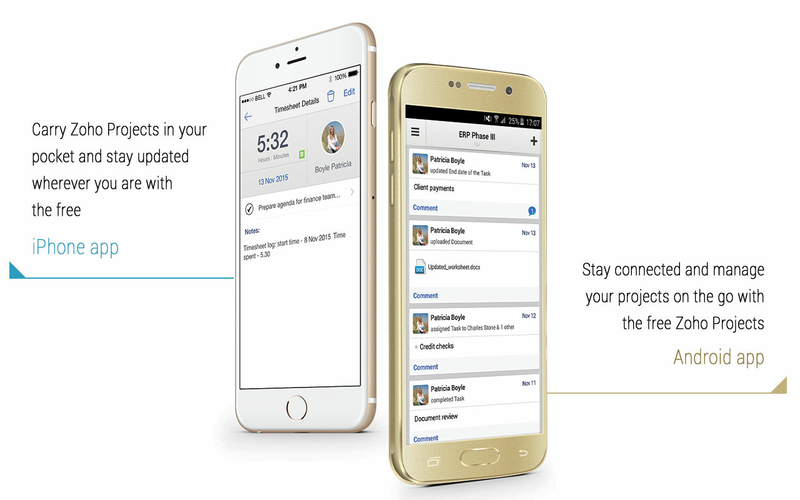 "He helped us in project monitoring, planning and management"
The program comes with Google Drive, Gmail and Calendar integrated which makes it very versatile when using add-ons, in addition to these has the ability to automatically synchronize with Dropbox. Its failure and incident tracking module is essential to correct errors in time. Their task lists facilitate the management of the elements of the work in addition to having the option of milestones to be able to have total control of what members do and progress within the program. The reporting tools integrated with the program are a bit limited, apart from this it requires a lot of customization to be able to adapt to an agile workflow adapted to reality. The design of the interface with the user is not so friendly and tends to stay a bit behind compared to other software. Although its interface with the user is not the most ideal and has shortcomings in terms of tools for controlling expenses, its strengths such as its efficient module for tracking incidents and failures, tracking time and billing ideal not to waste time unnecessarily during the project, make it a competitive software and worthy to be at the top of the list of programs of this type. With Zoho Project the company systematized in a very efficient way all the tasks to be done, thus creating projects that bridged a great impulse within them. The use of working groups was essential to achieve these results and the capacity of this program to allow groups to work and collaborate in a fast, planned and fast way was the foundation of the results obtained. Zoho Projects - Project management, as effective as it gets.